codeREADr Adds ‘Direct Scan to URL’ Method for Merchants, Venues, Memberships & Schools to Validate Passbook Scans with Mobile Barcodes Against their Own Databases or Those Hosted by their Service Providers. codeREADr today announced offering a new method to securely validate Passbook Passes where scan data from the codeREADr app is posted directly to the servers of merchants, venues, memberships, and schools or to the service providers hosting their databases. This Direct-Scan-to-URL (DSU) option complements the current offering where codeREADr hosts a client’s database for validation in the cloud (or locally) and the client subsequently retrieves scan data through APIs. With both options, we aim to make the scanning & validation of both Passbook and non-Passbook assets seamless. The validation database can be populated with Passbook barcode values along with those delivered to consumers via alternative formats, such as paper, plastic or competing wallet apps. The codeREADr app for iOS and Android can quickly scan QR codes as well as EAN/UPC, Code 39, Code 128 and DataMatrix codes using just the device’s own camera. Alternatively, the device can be paired with Bluetooth or USB scanning accessories. 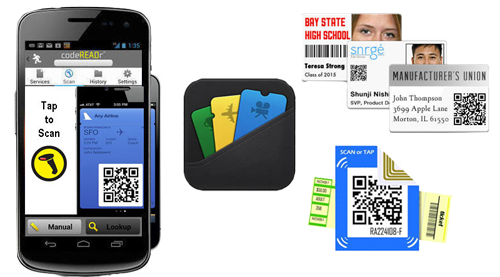 “We see Passbook as a catalyst for mass adoption of transaction-embedded mobile barcodes. We expect a huge demand for real-time information services to scan, validate and update passes. Toward that end, we have been aggressively deploying Web-service APIs and improving our scanning technology, which will soon include 100-millisecond scanning of PDF-417 and Aztec Passes with the device’s camera alone,” said Rich Eicher, CEO of Skycore. codeREADr‘s SaaS platform is a cloud-based auto-ID and data capture (AIDC) solution which enables mobile apps to read, track & authenticate data-embedded barcodes & NFC objects. Data embedded objects may include tickets, coupons, inventory, and virtually any asset as well as membership, corporate, student, patient and other IDs, whether presented in print or mobile.